I realize on the surface this sounds like crazy talk. And it is crazy talk if we’re talking about financial records, legal records or other documents that you need to hold onto for tax or legal purposes. But, what about paperwork for projects that have long been completed? And how about outdated articles,decorating ideas, or fashion tips? If you find there’s a category of paper that you’re filing by choice, but never retrieve, it’s time to stop filing! How likely is it that I will retrieve this paper or even remember that I have it at a later date? Could I find this information elsewhere more quickly? What is the possible consequence for not keeping this piece of paper? File what you need and what you will retrieve, and think long and hard about why you’re keeping and filing anything else. Do you find yourself filing things that you never retrieve? Please share in the comments below. Wow! Of course, but we do it all the time, if we even get to the filing stage, and not just piled onto a stack. Thanks for the push. I’m just about to go through some recent papers – do I need to even read through them again, let alone file them. Thanks again for your insight. Good luck with your decluttering and house adjustments. Thank you, Stasia! Good luck with our paper organizing! Good point about feeling like we’re supposed to hold onto things. Perhaps the first step is decluttering our old beliefs. Ha, I love that one! I’m just going through old – very old – piles of magazine cut-outs, where I ask myself exactly these questions. It really helps to let go of these old things, even if the ideas were good ones. But if you never have thought of them until now you won’t go looking for them there at a later time either. Thank you for your good thoughts to letting go of things! Thank you, Tina! Good luck with your paper organizing project. I’ve decided to quit buying or subscribing to magazines. With Pinterest and Google, most of what I want is available on the web. Now if I can just bring myself to tackle the binders full of clippings from years past! I hear you, Becky! I have a few of those myself. I need to purge my filing cabinet – I know I’ve filed travel related items (that really my husband insisted we keep) but I’ve never once used them for planning a trip. Thanks for the push to add this project to my to-do list. Yes! That last question is the one that really hits a chord with me. What are the possible consequences if I do not save this? Thanks so much for your encouragement! Thank you, Carla! I appreciate your comment. Like Becky I no longer subscribe to magazines. Wow, what a difference! Difference in the size of my reading basket as well as the work they brought for clipping and filing (putting in binders). I also found I would clip less and less just because I couldn’t be bothered with the work involved. I still enjoy the few binders I made though. Recipe binders, home decorating ideas and techincal info for digital scrapping – quick cheatsheets I refer to when needed. I do go through the recipe and home binders from time to time. I do get rid of some recipes but the home ideas still make the cut even though I have no immediate use for them. I still like the ideas though. As I have them in categories like kitchen, bathroom, attic, general atmosphere it will be easy to look at them when I do have a specific project in mind. I just don’t add anything to the home ideas anymore. Pinterest is my go to source now. I agree. I’m not sure what would happen to me if Pinterest went away. Yikes!! This came at a perfect time, especially since I’m dealing with my own house of clutter, have recently inherited my deceased grandmother’s house of clutter, and still purging my decades father’s clutter from a few years ago. Being so overwhelmed by all this, I just get paralyzed. I love the lightbulb phrase you posted. And the questions are very helpful. I’ll be utilizing both of these tools. Good luck getting through your project! 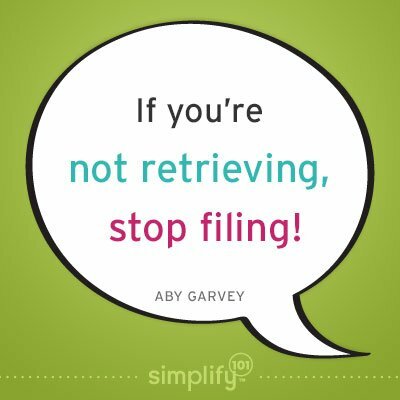 Do you find yourself filing things that you never retrieve? To answer this question, yes!! We have a full size metal filing cabinet where the drawers are hard to open due to stuffed files and piles. A few years ago I vowed to go through each file once a year and purge what we don’t need to keep. So far, I’ve purged maybe 10 files in all that time! And when I purged those, I found tons of stuff I wished I’d remembered and could’ve/would’ve used at some point. So THAT isn’t working for me! Fast-moving evolution in technology makes for a challenging transition for those of us who didn’t even know what a cell phone was as a teenager! For those who identify with that, hang in there – we’re doing alright, even if it takes time to get it down! That’s right – you’re doing alright. Thanks for your comment! This is so simple but so true. I keep every credit card statement and I have never needed to look back at one. It is all online but I have this need to keep them. I think I feel good about filing them. I will look at that this weekend and start pitching. I’ve noticed there’s a tricky, little thought that lurks into my mind every time I decide to have my office space purged from all the unnecessary stuff that have accumulated during the week. It’s tricky because it tells you “Don’t you dare throwing that away, you will need it and will definitely use it later!” But that “later” very often doesn’t come. Those questions at the end are really helpful when it comes to convincing yourself that you don’t need that clutter. Thanks!